We at StokeCity AdventurePark are big believers in 'Sharing is Caring'. So we are calling on all of you to help us Share the Stoke. Only once you've experienced the feeling of riding 'on-top' of water will you know what we are on about. Cable wakeboarding is a fantastic sport, with a great vibe! So let's grow the community and introduce new people to the sport. 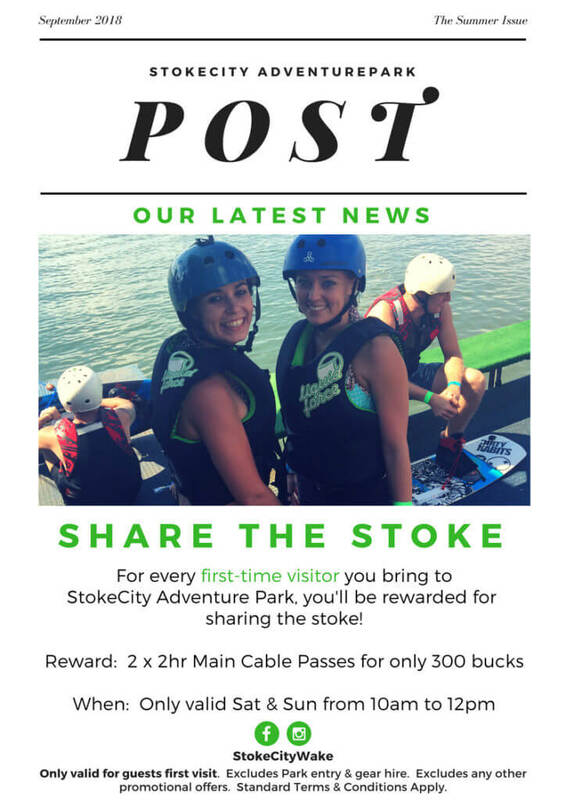 Starting in September, we will reward existing customers for every first-time visitor they introduce to StokeCity AdventurePark. When you bring a first-time visitor to experience the stoke, you will be rewarded. For just R300 you will get 2 x 2hr Main Cable passes! Your cable pass includes a life jacket, helmet and a kneeboard or water-skis. Just remember to bring along your own gear, or if you don't have then you will still be able to rent gear. The deal will run every Saturday and Sunday up until 12pm. There is no need to book, just pitch up as per normal, pay your R40 park entry fee and go through to the ProShop.